Junk food is everywhere. It's become more of a convenient food to most of us, be it a sugar-laden biscuit or cake, chips, soft drinks, sweets, fast food like burgers or pizzas. We always associate the western foods to being junk, but even Indian foods like mixtures, murrukus, vadas, sweets or even some of the yummy evening chaats can be considered pleasurable only to the palate. 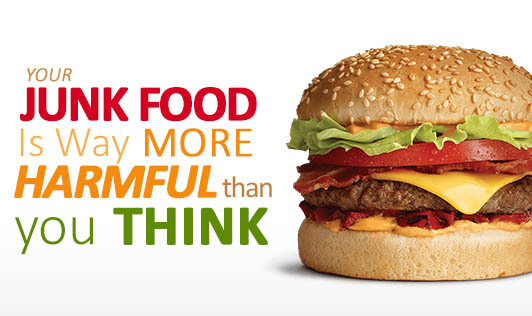 * The regular consumption of junk food is the leading cause for obesity and excess weight. * Consumption of soft drinks containing sugar has been linked to weight gain and an increased risk for development of type 2 diabetes. * Also the consumption of soft drinks that contain phosphoric acid, hinders the calcium absorption and leads to calcium loss in the bones. * Junk foods increase the risk of heart disease. * High fat from junk food puts undue strain on the liver, causing damage to this essential organ. * Research has suggested that diets high in fat may also impair essential brain functions, like concentration and memory. * Flavorings and colorings present in junk foods can cause asthma, rashes. * Tooth decay and dental caries due to the excess amount of sugars that sweeten the drink. The junk food industry deliberately targets children to create brand preference. Children fall prey easily to an attractive advertisement, which would also include their favorite cartoon or superhero in the advertisement. Fast food chains use free toys to get the kids to buy their products. Artificial flavors like the tomato flavors in chips or strawberry flavors in wafers aimed at kids can be twice as sweet as the artificial flavors used in adult food. Parents also sometimes treat children with these foods to keep them from throwing tantrums. A better idea would be to reward them with something useful like a puzzle or a book instead of treating them to junk foods. You could even put your cooking skills to the test by making a healthy version of their favorite junk food and keep both happy. Junking over a period of time becomes a habit. So try to stay away from it.